The best business books such as this one are driven by scholarship, a process during which information about a given subject is accumulated and evaluated, then shared with others. Christine Borgman is among the most highly-regarded knowledge leaders in the burgeoning field of data scholarship. It came as no surprise to me that she needed 91 pages to cite the scope and depth of her own research for this book. “Big data begets big attention these days, but little data are equally essential to scholarly inquiry. As the absolute volume of data increases, the ability to inspect individual observation decreases. The observer must step ever further away from the phenomena of interest. New tools and new perspectives are required. However, big data is not necessarily better data. The father the observer is from the point of origin, the more difficult it can be to determine what those observations mean — how they were collected; how they were handled, reduced, and transformed; and with what assumptions and purposes in mind. Scholars often prefer smaller amounts of data that they can inspect closely. When data are undiscovered or undiscoverable, scholars may have no data.” See what I mean? Obviously, no brief commentary such as mine can possibly do full justice to the abundance of valuable information, insights, and counsel that Borgmnan provides but I hope I have at least indicated why I think so highly of her and this work. Every day, we create 2.5 quintillion bytes of data — so much that 90% of the data in the world today has been created in the last two years alone. 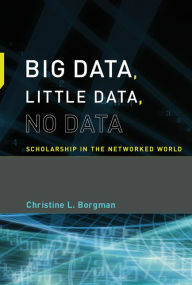 I agree with Christine Borgman: “The challenge is to make data discoverable, usable, assessable, intelligible, and interpretable, and do so for extended periods of time…To restate the premise of this book, the value of data lies in their use. Unless stakeholders can agree on what to keep and why, and invest in the invisible work necessary to sustain knowledge infrastructures, big data and little data alike will become no data.” That is the peril and, yes, the opportunity that await in months and years to come.